This year 2016, Jeanette will be running the NYC Marathon to raise funds for “Keep a Child Alive” a non-profit organization co-founded by her client Alicia Keys to provide health care, medicine and support to children and families affected by HIV. No matter what struggle we are going through on a daily basis, we can always do something to help others. Serving and helping others has always filled me with joy. One person is powerful and when we collectively put our power together we can do anything! I invite you to join our support team by donating whatever you can to help support this incredible organization that supports the lives of 70,000 people annually in Kenya, Rwanda, South Africa, Uganda and India. 100% of the money raised goes towards treatment and loving care for children and families affected by HIV, you can trust that you are making a difference. Click HERE to donate! 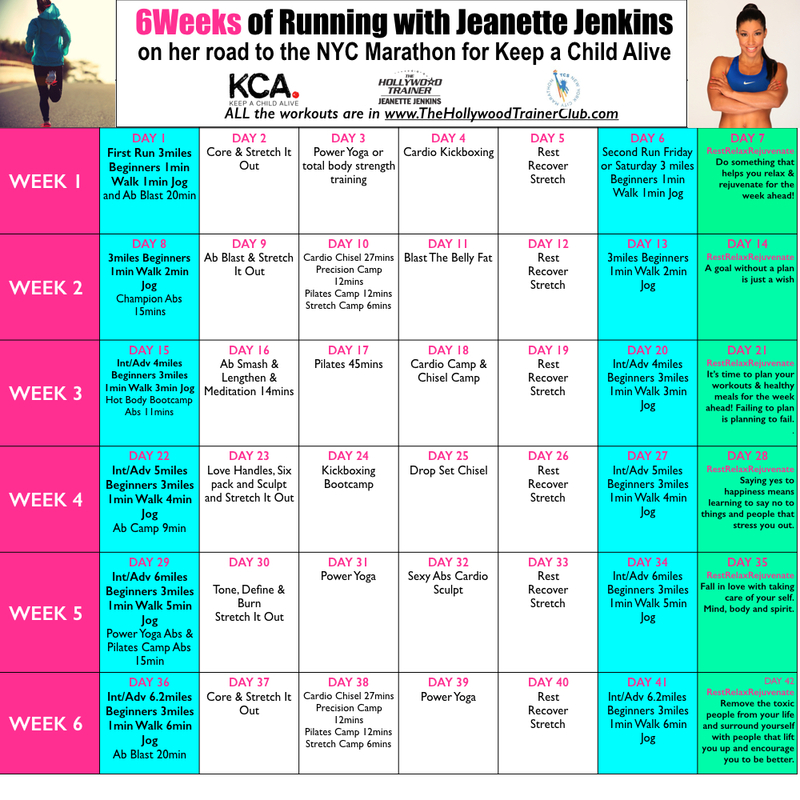 To motivate you all to add running or power walking into your weekly workout regimen we’ve put together the 6Weeks of Running with Jeanette Jenkins Program perfect for beginners, intermediate and advanced. We are challenging you to run/walk two times a week and cross-train three times a week . All the workouts for the three cross-training days are in The Hollywood Trainer Club and they include Power Yoga, Body Sculpting, Weight Training, Bootcamp, Pilates, Core, Focused Ab Work, Kickboxing, and so much more . The workouts are convenient you can do them on your phone, on your computer or your tablet anytime anywhere. The run/walk you can do outdoors or on a treadmill. The goal for beginners is just to be consistent with walking or running two times a week. Even if you don’t complete the full 3 miles, do your best, one mile or two miles is better than not doing anything at all. The goal for intermediate and advanced is to increase your endurance. We start with 3 miles and then increase the distance each week until we reach 6 miles. You can do it! Below is the “6 Week Running Schedule” that you can print out and post in a place that you will be able to see everyday. Put it beside your bed, on your fridge or in your office. You can even take a screenshot, save the calendar to your phone or computer and have it as a screensaver. 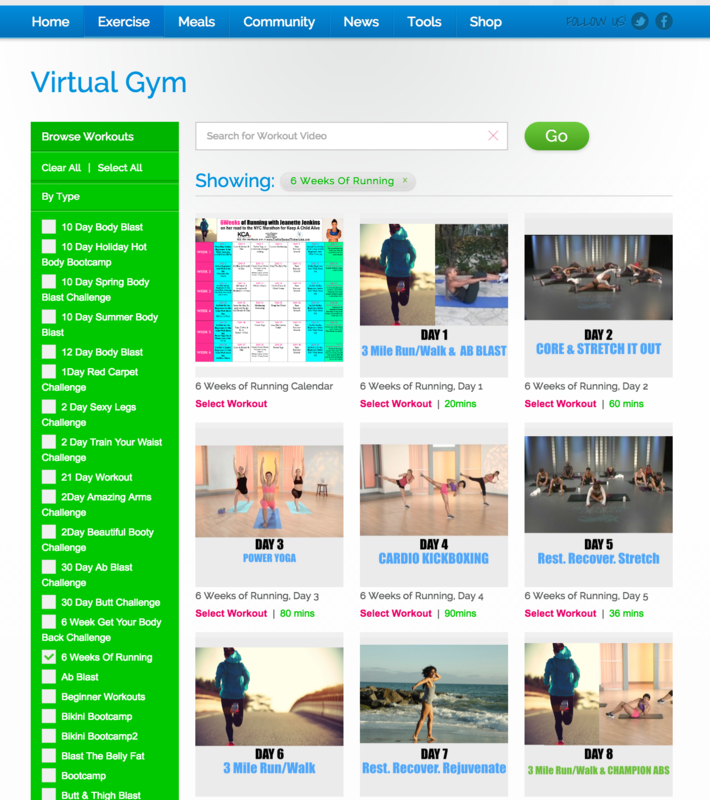 All these workouts are in the Virtual gym, just log into The Hollywood Trainer Club to see the full 6 week program. We will be with you every step of the way and every week we will be posting motivation & tips on Instagram, Facebook and Twitter. We will be giving you nutrition tips, recipes and motivation and of course more tips about running. Mark your calendar Monday, September 12th for your first run! If your goals is weight-loss then this is definitely a program that will help you burn hundreds of calories and sculpt & tone your entire body. Of course you must follow the meal plans in The Club because you have to have a calorie negative at the end of the day for weight-loss and to burn fat . The combination of this program plus the meal plans in The Hollywood Trainer Club will definitely help you burn additional body fat. Post a message on the Community Wall in the club and let us know that you’re joining us! You can also ask Jeanette any of your fitness and nutrition questions on the Community Wall. She answers them every week. Let’s go! You can do this!